Can I Steal Your Ideas? 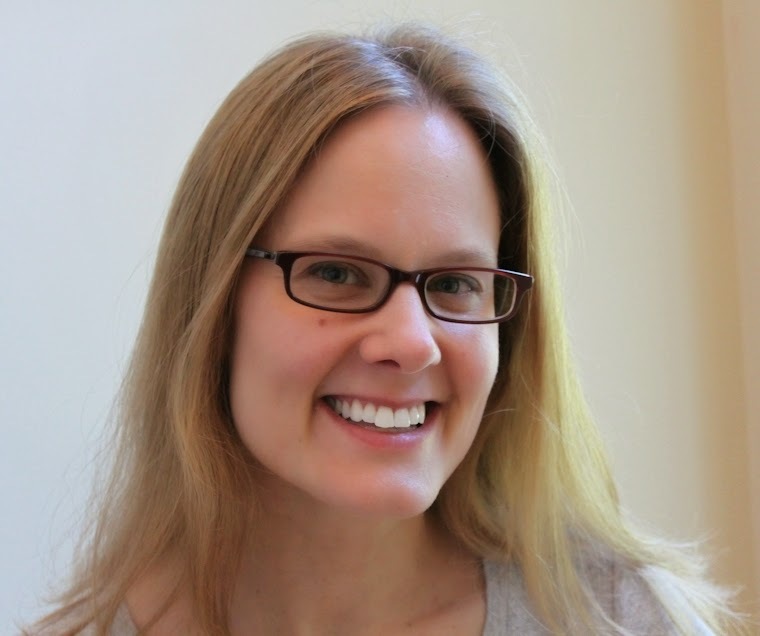 When I started blogging, I was on the search for community. I wanted to connect with people who were just as crazy as I was about fabric and sewing and quilting. I found what I was looking for (thank you! ), but it wasn’t quite enough. I needed some in-real-life quilty friends. for Christmas. Aren’t they pretty? 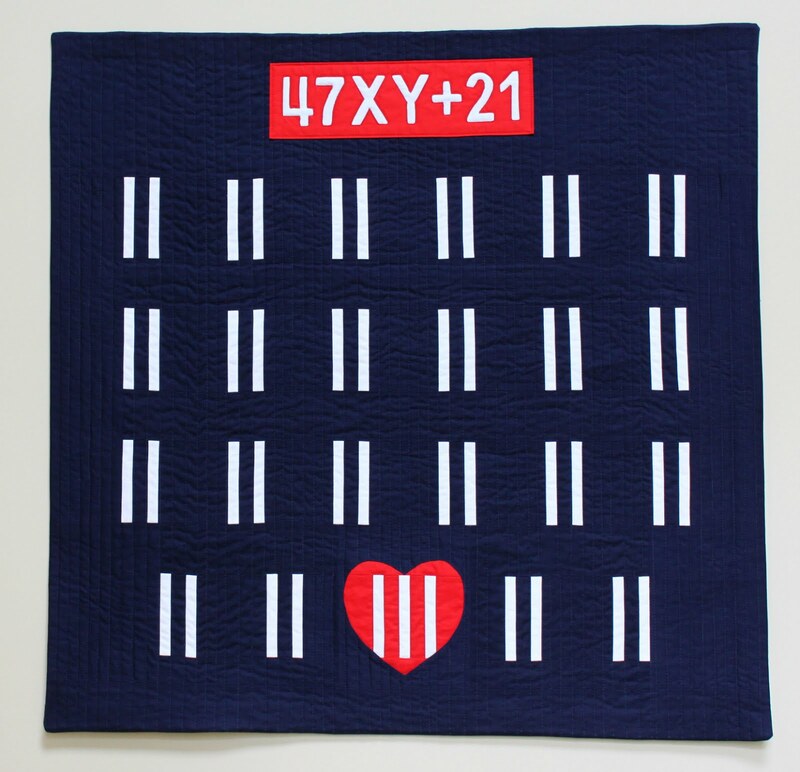 Then the New Hampshire Modern Quilt Guild entered the picture. Joining that group gave me the in-person connections I was looking for. And we have a blast. In addition to our monthly meetings, we have workshops (see my posts here and here), retreats (see here), and other fun events. Ice breakers. What activities can we do just to get people talking? Block of the month. The BOMs we’ve done to date have been sizable commitments, and that has deterred a lot of people from participating. What can we do on a smaller scale that is still rewarding and that encourages new skills? Challenges. I’m pretty sure we haven’t done any challenges within our guild. (We have, however, participated in some as a guild through the national MQG organization.) What are some fun ones? Collective knowledge. There is so much experience and knowledge in our guild! How can we share it with other members? at the NHMQG’s Christmas party. If you’re in a guild, I’d love to hear what has worked for your group, what you’ve found compelling, and what you’re likely to do again. Please share your best practices in the comments. Thank you! If you’re not in a guild, I recommend trying one out. 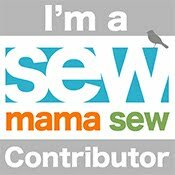 Each one is different, but after visiting a few, you may, like me, find a group of supportive, talented sewists who make your quilting hobby even more fun. The Best of 2015? That’s Debatable. 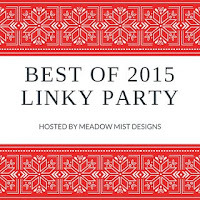 Earlier this month, Cheryl of Meadow Mist Designs put out the call: Compile your best posts of 2015 and participate in an end-of-year linky. Sign me up! If I look at the numbers, my best posts—those that received the most traffic or garnered the most comments—are easy to spot. 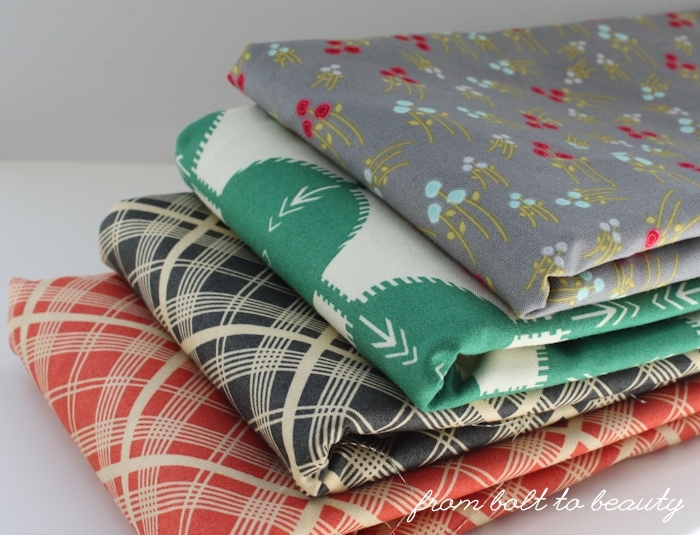 They’re the ones that featured giveaways or received some third-party seal of approval, like my post for the Fat Quarter Shop Jolly Bar Blog Hop or my tutorial for the Moda Bake Shop. Not surprising, right? If you’re feeling creative, I would love to hear what you would like to see on next December’s best-of list. 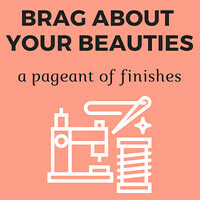 Best Embarrassing Moment in Front of a Quilting Celebrity? Best Non-Sewing Use of a Sewing Notion? Best Single-Day Purchase of a Staggering Amount of Fabric? I have a full year to make good on your ideas. I hope not to disappoint! I’m closing in on having made two dozen baby quilts, throws, or bedspreads in my fledging quilting career, and so far I’ve quilted them all myself. 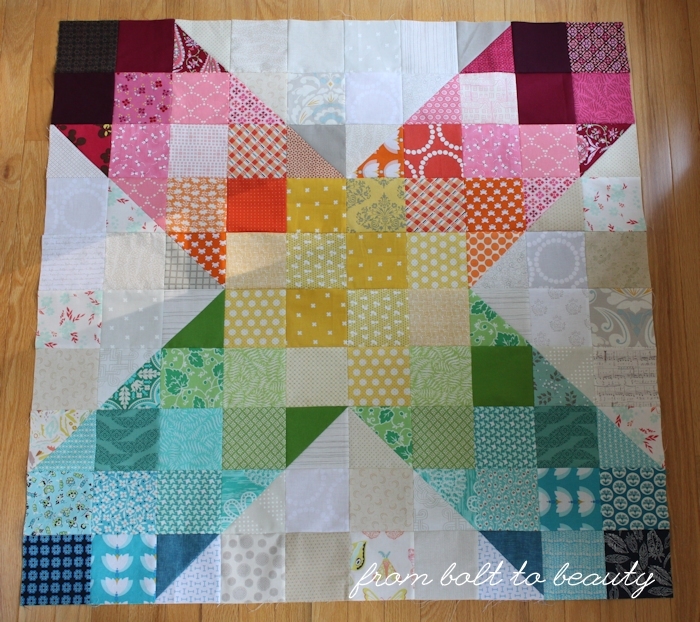 I like being responsible for every step in making a quilt; I like saying that a quilt is 100% mine. Although I almost exclusively straight-line quilt (an exception is here), I think my quilting adds to the overall design of my projects. 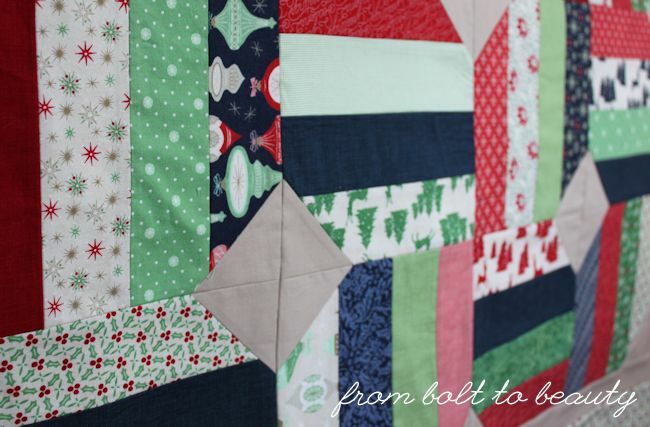 Using a pattern from Meadow Mist Designs, I pieced this quilt top last year with the intention of gifting it at Christmas (yes, Christmas 2014). 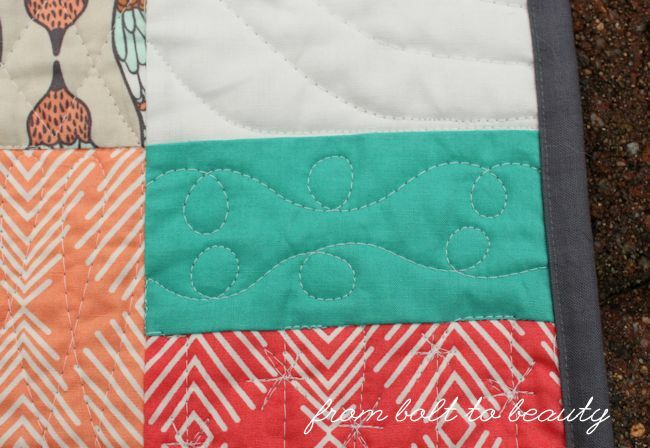 Straight-line quilting wouldn’t do this design justice. It really needed something less linear. 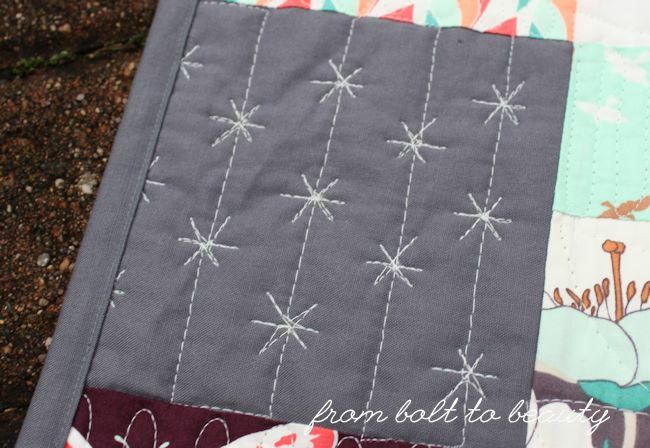 I tried my hand at free-motion quilting to see whether I could FMQ this entire throw. It was not fun, and I decided to call in the reserves. That is where my friend Mary came in. Mary does amazing work on her Handi Quilter, and the quilt that had me wringing my hands was for her an opportunity to have some quilting fun. 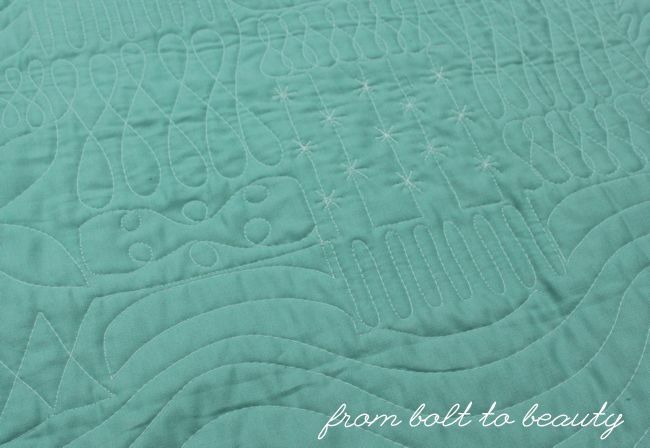 The quilting is best viewed on the back. I adore these sweet scrolls! The back features more Winged. The green-blue fabric is Kona Sage. What do you think? Have you ever hired the services of a longarmer? 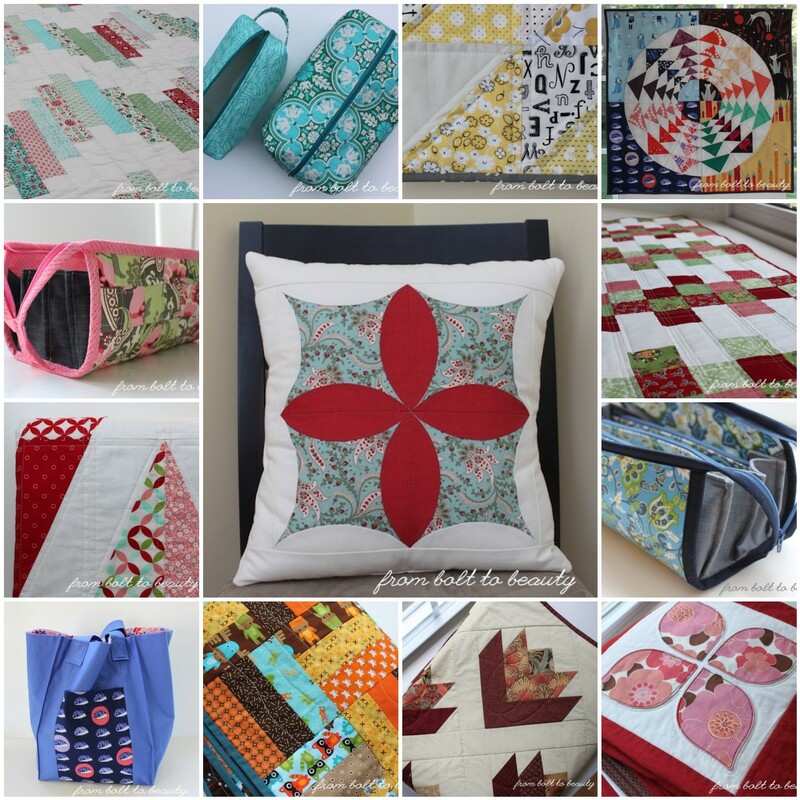 And if you have, do you still quilt some of your projects yourself on occasion? If you have some longarmer horror stories, I want to hear them, too. 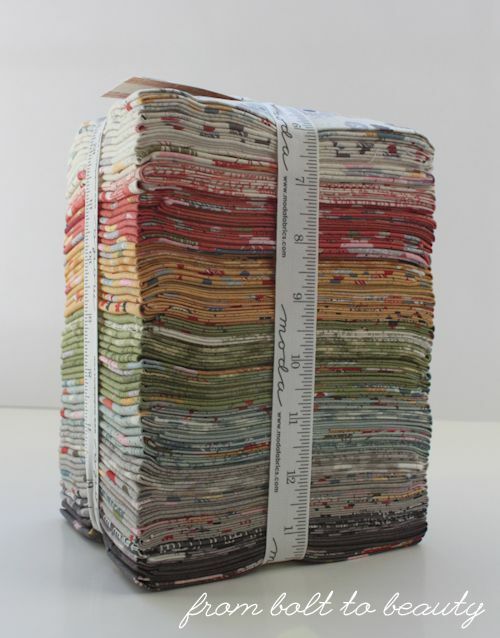 (Read what my friend Jen experienced with one of her quilt projects.) Now’s the time! 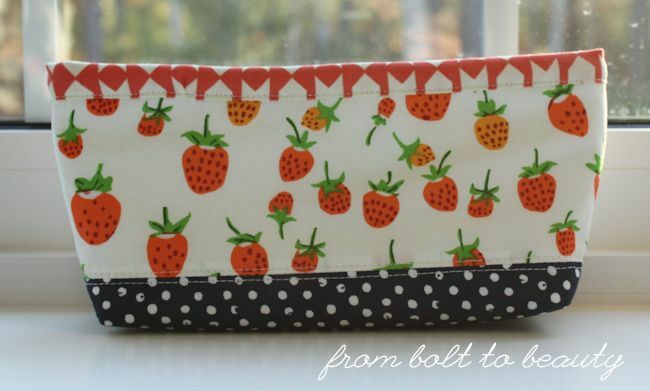 Bring on the Dancing Horses, and Another Sew Together Bag. Center picture: Orange Peel Pillow. 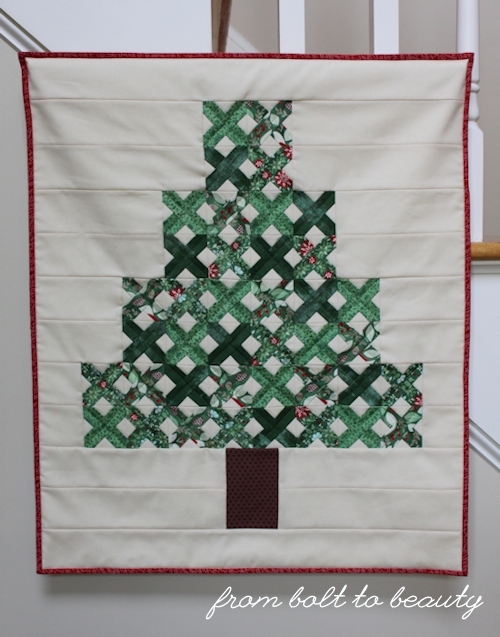 This mini quilt, named The Tree Is Trimmed, is 21 inches by 25 inches and is ready to hang. 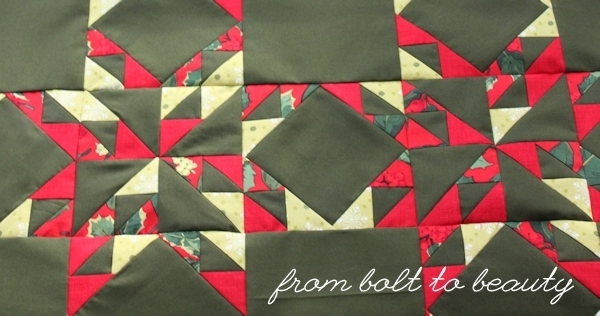 It features fabric from Basic Grey’s Evergreen line and was pieced and quilted by me. For chances to win this beauty, read the rules below. 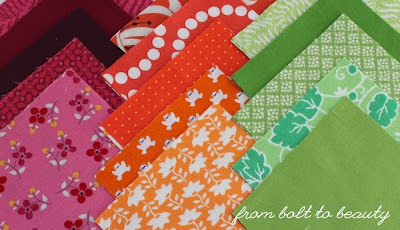 To make your own version of The Tree Is Trimmed, see the tutorial here on From Bolt to Beauty or here on the Moda Bake Shop. For a first chance to win, leave a comment, telling us what one sewing- or blogging-related resolution you hope to keep in the new year. I, for one, plan on getting proficient at taking and posting better pictures. Instagram users can get a third chance by reposting my IG post about this giveaway and using the hashtag #frombolttobeauty. Old and new followers are welcome to leave a comment. If you’re on the fence about following me, give me a month. 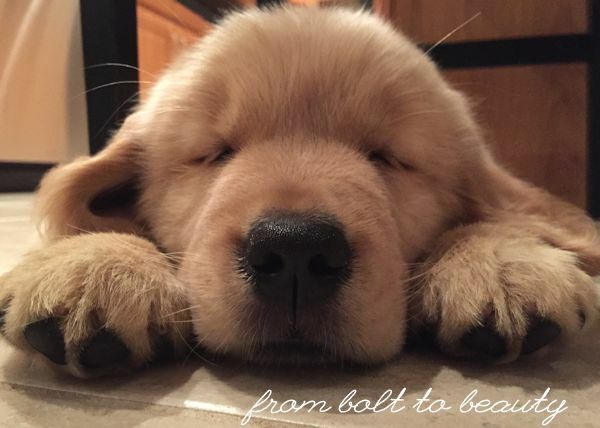 Both here and on Instagram, it’s all crafts all the time. We’ll laugh. We’ll cry. And by the end of the month if you’re not into my scene, we’ll part as friends. No hard feelings. This giveaway is open through Sunday, December 13, at 8 p.m. eastern time. Mr. Random Number Picker will select a winner. I’ll post the winner here and email him or her. Good luck! I had promised myself that this year my holiday sewing projects would not get out of control. 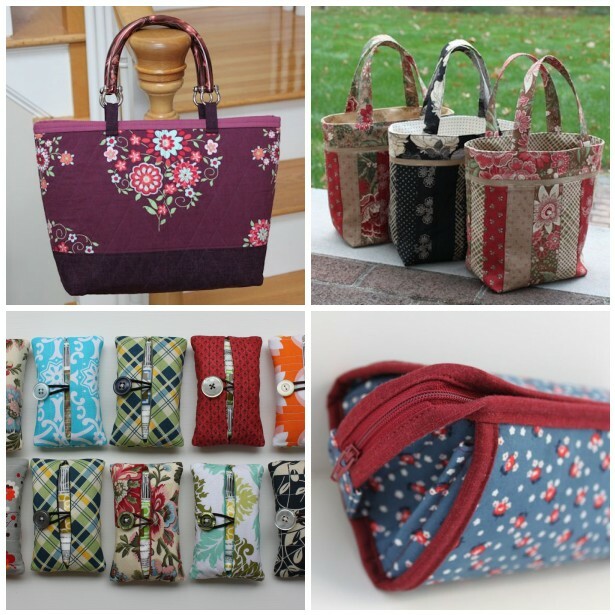 I’d choose a reasonable number of items to sew and gift. Lots of ideas would have to fall by the wayside. So be it. And then, on Black Friday, my reality skills went out the window. 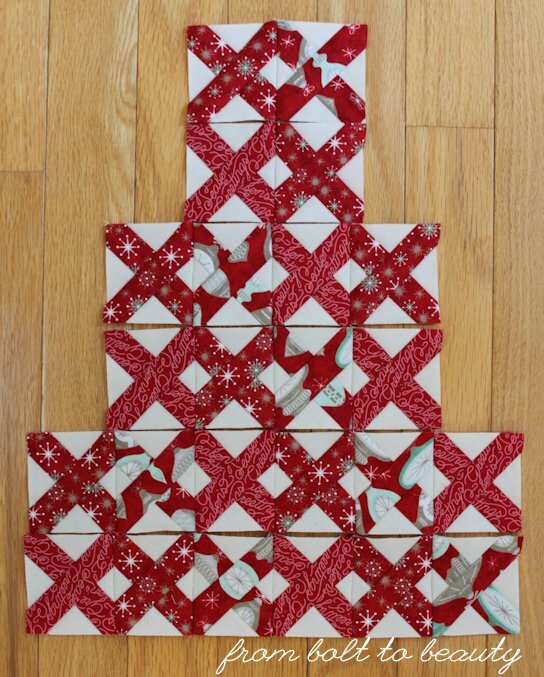 I saw some jolly bars on sale at the Fat Quarter Shop and thought that I could add another throw-size quilt to my Christmas to-do list. Because, really, half the work was already done—it was precuts, people! My inner voice of reason chimed in: I would have to finish everything else on my list before embarking on this latest pet project. Sigh. Listing those projects is sobering. 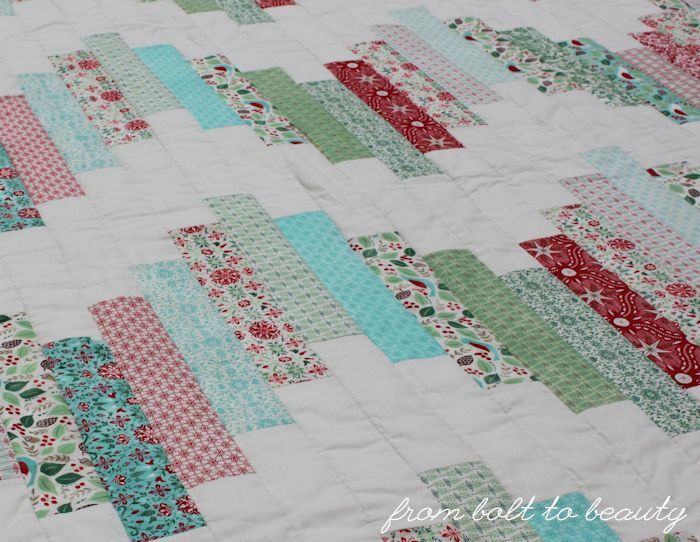 I know producing another quilt from start to finish in the next 20 days is a long shot. 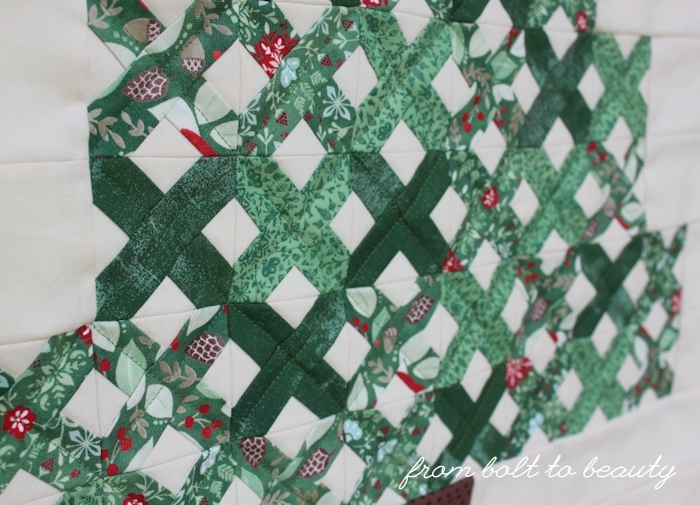 Last year, I had two pieced quilt tops at this point in the holiday season. 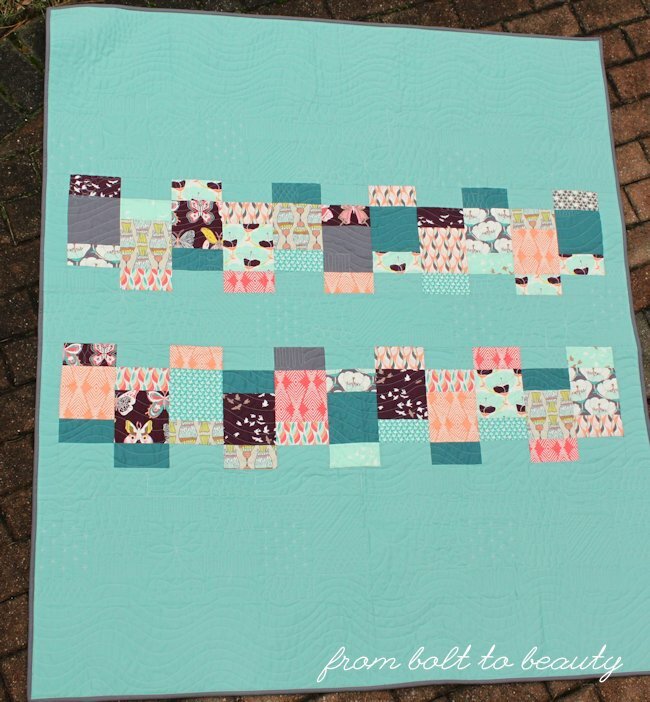 All I had to do was learn how to free-motion quilt and they’d be done! 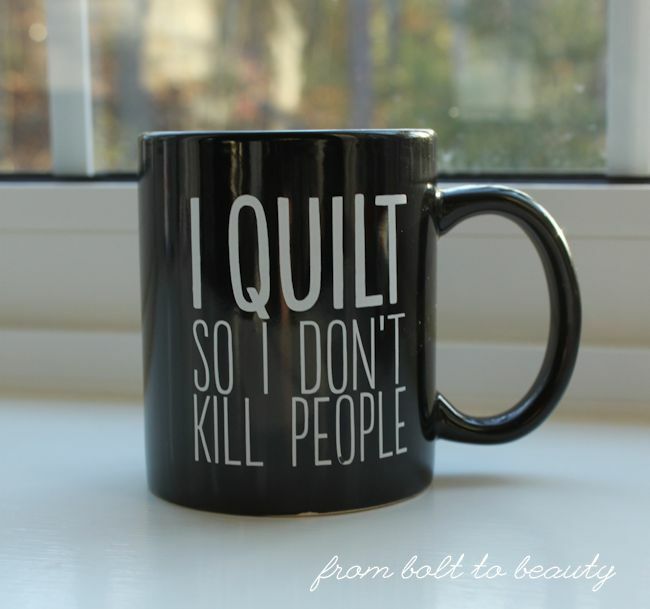 In the end, one was gifted a few months late and featured some minor FMQ. 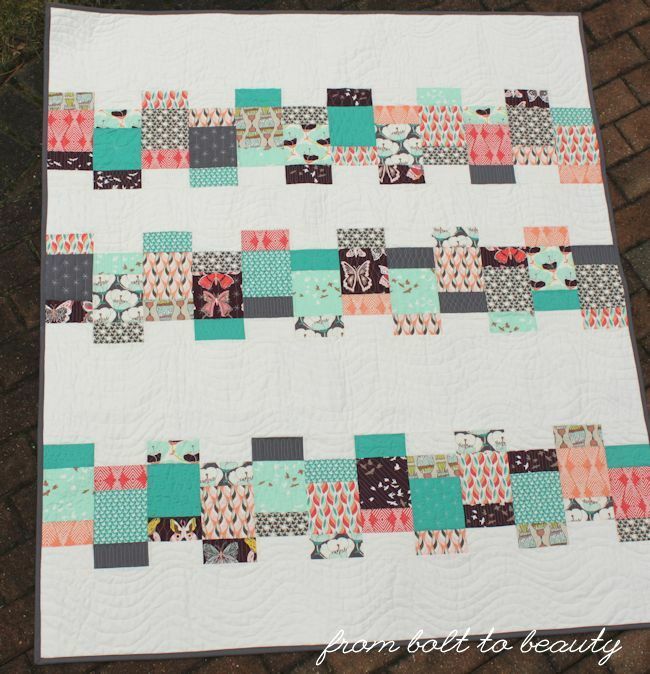 The other quilt originally intended as a Christmas 2014 gift has become a Christmas 2015 gift and is with See Mary Quilt for quilting. Not bad, right? I’m hoping to have similar success this year. Gulp! 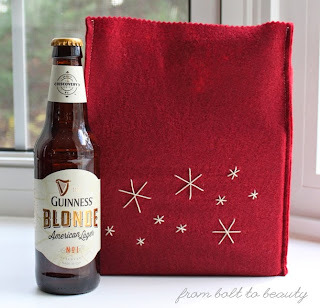 So how is your holiday sewing shaping up? (This is a safe space. No judgment here!) Are you swiftly checking completed items off your list, or are you (as I suspect I will have to) paring down your expectations?